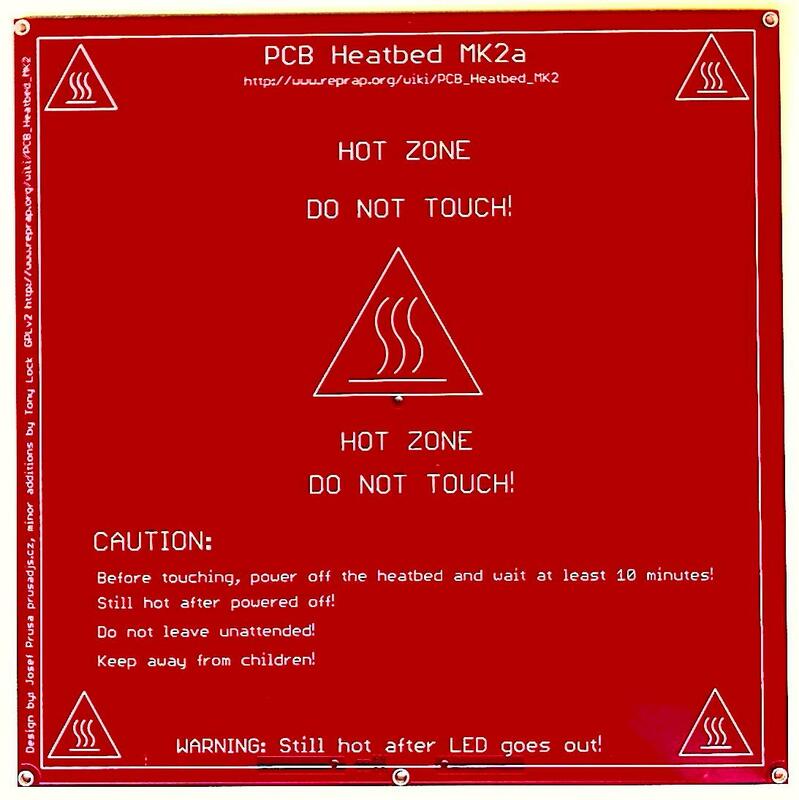 I have made a number of small design changes to the MK2 heatbed. These are as a result of feedback from customers and advice from members of the RepRap community, especially thanks to Nophead for his extremely helpful comments. Bed levelling. I added another mounting hole mid way down the front side. This allows for three point mounting and a much simplified bed levelling. I got the idea from Nophead in conversation and his blog post on bed levelling. It is worth noting that this idea has been addressed a number of times before using three points between the bottom and top plate on a Sells/Prusa Mendel: see Kritzinger.net and NumberSix's blog. The advantage of having it on the heated bed is machines like the Mendel90 with one platform under the bed can also benefit from the point mounting and easier levelling. Cable soldering. On the subject of the Mendel90, soldering ribbon cable to the big exposed pad areas is much easier now (previously I had scraped an area to solder onto, once again copying Nophead, in this case in the Mendel90 build instructions). In addition the through holes are larger to allow for thicker cable to be fed through from the other side if not using ribbon cable. The redundant pads have been removed from the other side of the board as, with no plated through holes, they were not electrically connected. The Eagle board file is available on the reprap wiki,and the boards are available through our webstore as well as eMakershop and eBay. 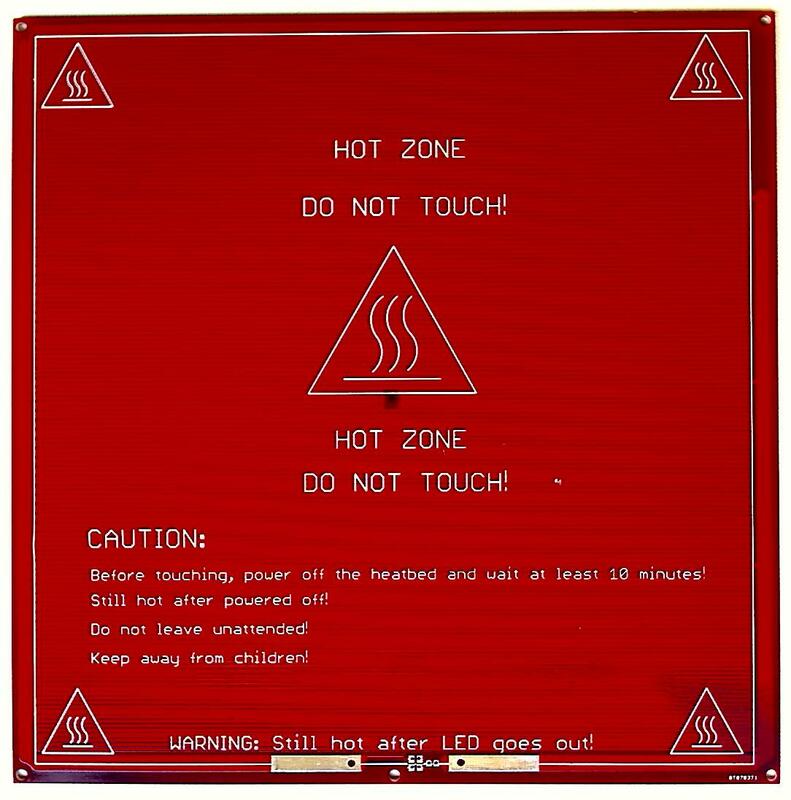 i have edited the reprap wiki (http://www.reprap.org/wiki/PCB_Heatbed#MK2) with more info and pictures and will do another blog post with pictures of the Surface mount LEDs and other developments. Hi Tony, If you could show your approach (picts) to attaching the thermistor I would also appreciate it. You've made some good improvements to the MK2. I'll be moving on to ABS in a while and your MK2a heated bed may replace my current resistor based one, as it can't quite reach the required temperatures for ABS. I use an EPCOS 100k thermistor and push it through the center hole so it makes contact with the glass on top of the bed, I then tape it in place under the bed using a high temperature tape like Kapton. If you need pictures I can take some the next time I assemble a bed. I purchased one of your boards the other day. The large connection points make a very easy to solder thick wiring to. A surface mount thermistor location would be a nice next iteration, with connection points tracked to the perimeter. I saw a design file pop up for that somewhere on the net. Can't find it now. I'm also using the middle hole giving easy bed levelling. I'll post some picts to my blog in the next while. Hi, glad you like the improvements. I have the thermistor and changing the pattern of the resistive tracks (suggestions by Nophead to balance the heating). I think people should note that when you support the PCB by three points the rigidity of the build surface is provided by the glass plate. The PCB has no major structural rigidity in itself and is clipped on to the glass plate to ensure the good contact and heat transfer. The stiffness of the surface is provided by the glass. Do you concur with this?